weekends. Please come visit us. Large Matted Photograph: "Silent Elder"
Here I am playing Vanna, showing off the 26" by 55" matted photograph shortly before we shipped it out. 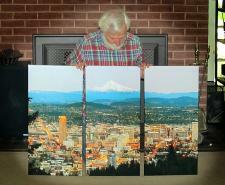 The clients saw the image at our booth at the Portland Saturday Market presented as a three part framed photograph. 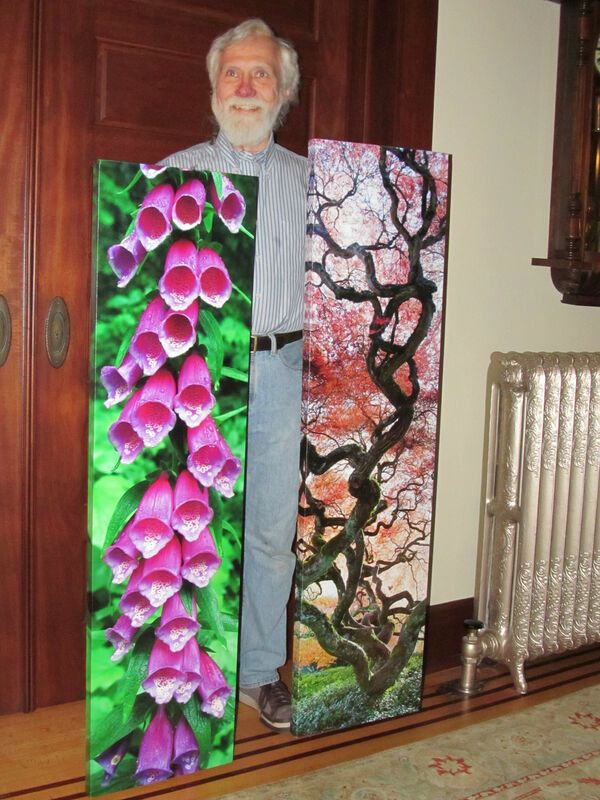 They asked if I could do it as a single 20" by 48" photo in a large mat. 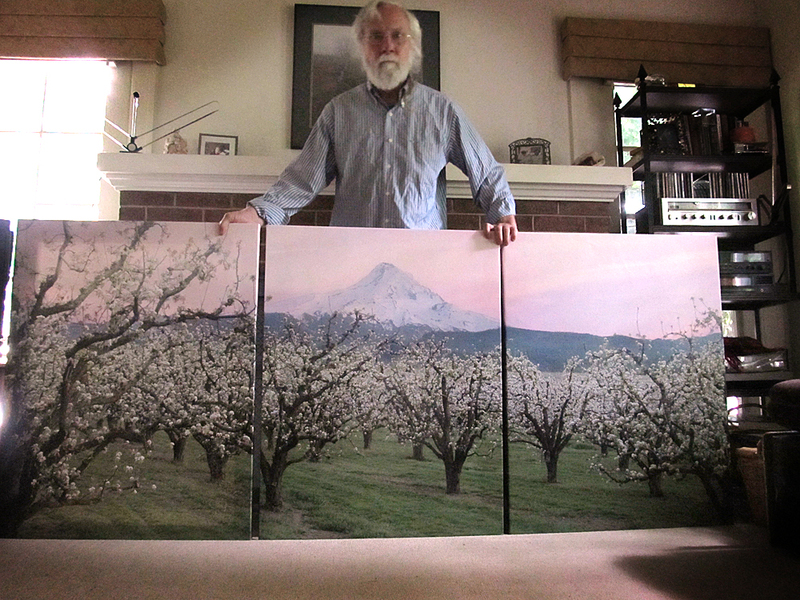 We got a custom order for a canvas triptych of our "Portland Panorama - Christmas Evening"
A couple moving back to Oregon from California ordered a custom canvas triptych of a pear orchard in Parkdale at sunset with Mt Hood in the background. 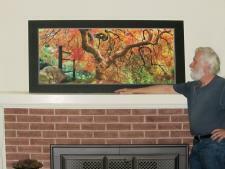 I have recently started creating canvases from our images. 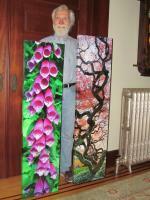 Here I'm standing with two new canvases, "Foxglove" and "Reaching for the Sky". 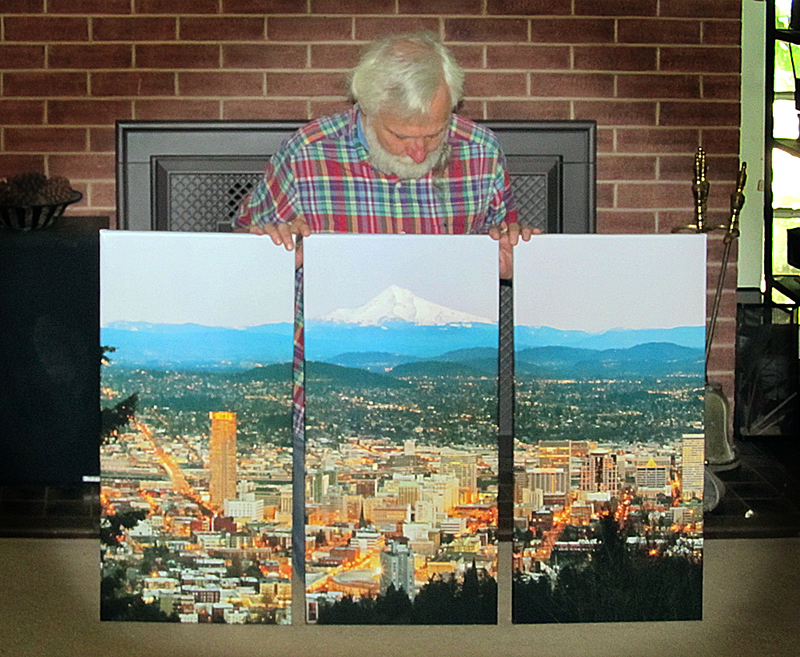 We will be showing these at our booth at Northwest Folklife at the Seattle Center this weekend. Come and see us! Went out to gather hawthorne blossoms with my friends Dave and Sarah and their daughter, Lily. It was great fun wandering about talking and discussing plants and nourishment. Hawthorne, a member of the rose family, has been used as a heart tonic for many years. While there are a couple native varieties, the most common one we see in the city is the European variety (crataegus monogyna) also called may or mayblossom. Inspiration for the name "Mayflower". We've just activated a brand new shopping cart for Tweten Photography! Our old model was in table format and had very inflexible shipping options. With our new cart, you can still see all the options on a table, but now, for the table-phobes out there, it's possible to see only the options you want with a couple clicks. 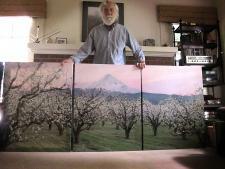 Here is an example page: "Mt Hood - October". University District Street Fair - Last Year? We're thinking that this will be our last year at the University District Street Fair in Seattle. We'll miss the Market the weekend of October 27th and 28th, but we plan to be back next week!